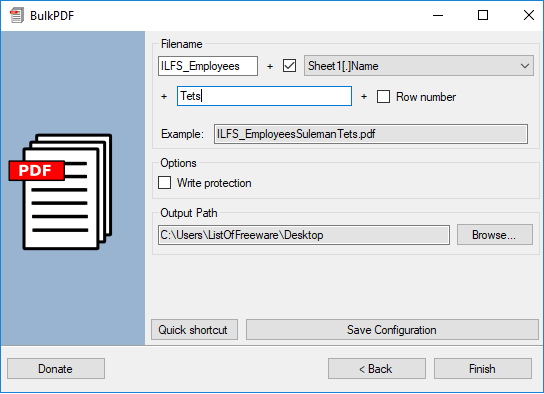 This tutorial explains how to automatically fill PDF forms in bulk using Excel sheet. To demonstrate this, I will talk about a free and open source software BulkPDF. The software takes a PDF file and an Excel sheet to fill the PDF form. And for each record from the Excel file, it will export a separate PDF file to the folder you specify. 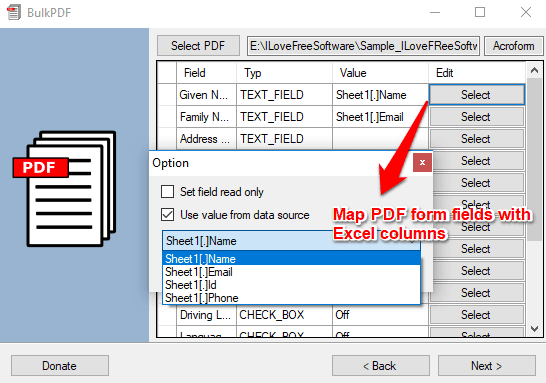 This software lets you map the columns from the Excel file to the forms fields in the PDF. After that, it fills the PDF form accordingly and generates the forms files in a few seconds. If you have to create multiple forms from a single template, then doing that manually will consume a lot of your time. So, in the smart way, you can make an Excel spreadsheet, containing records that you want to fill in the form. After that, call the BulkPDF software and it will do the rest of the work for you automatically. You just have to specify which fields of the form you want to fill with a record from the spreadsheet. And you can even save the current configuration for later use. How to Automatically Fill PDF Forms in Bulk using Excel Sheet? BulkPDF works in the same way as you see in mail merge. If you have used mail merge in Gmail or Mail merge for PowerPoint, then you will easily understand how this software works. You just need the source PDF form that you want to fill and an Excel file to map the field data. 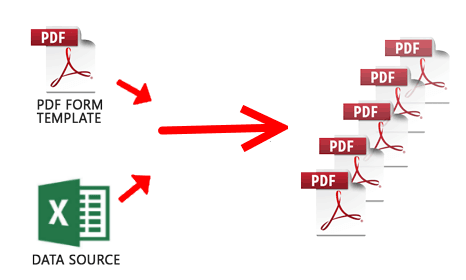 Here are the steps to fill multiple PDF forms using Excel sheet. Step 1: Run the software and the interface of the software will open up which is wizard like. 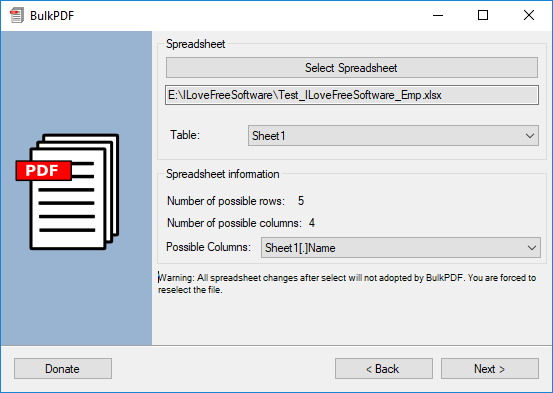 And on the first window, you will see the option to specify the Excel spreadsheet that you want to use for filling the PDF form. Step 2: Next, it will ask you to specify the PDF form that you want to fill. And as you specify the PDF file, it will list all the form fields from it. And you can then selectively define what value from the Excel to be filled in that. For that, you can click on Select button and specify the column from the Excel to map the data. Here you can also opt to mark the form field as read only. Step 3: Finally, after specifying the data mapping, you have to specify the output name of the file. Since the multiple PDF files cannot have the same name, you have to give a name that will be unique. So, you can opt to append a record from Excel field in the final name of the PDF files. Now, specify the output directory where you like to save the final PDF files. Next, hit the Finish button and it will export the PDF files in the same number as there are records in the Excel file. Also, if you want to write protect the final PDF files, then you can do that. Above, you can see how the software works to automatically fill PDF forms in bulk using an Excel sheet. And the BulkPDF software makes very simple to do that. If you often deal with PDF form filling tasks, then this is very helpful software for you. BulkPDF can really save you a lot of time that you would have wasted in filling multiple forms manually. It offers a really nice way of dealing with the multiple PDF forms. So, if you are looking for a free software to do the same what BulkPDF does, you can give it a try.